So I have a couple of cousins up in Williamsburg Virginia and my wife has some friends just a couple hours away from there and we decided it was high time to take a visit. So when we called them and asked them where a good place to rent a room was at if we wanted to hang out with them they offered to let us stay at there house… something I secretly and almost manipulatively hoped they would offer. I could just see them in the back of my mind scrambling to clean the house for our arrival as we boarded the plane, almost feeling guilty. Anyway we landed on Tuesday morning around six and rented a Dodge Charger from Avis and made our way to their house. After a long night of flying and watching boring television reruns on the airplane the only thing my family was looking forward to was crashing. Well everyone that is except my one son that sleeps a total of four hours a day. At first I assumed it was for attention but now I know it’s just the ridiculous amounts of red bull and caffeine he consumes on a regular bases. Anyway the women decided the next day which would be Wednesday that they wanted to go shopping and my cousin told me that we had to go take the kids to see the Jamestown settlement while we were in town. Best of all he said it would be pretty darn cheap for the seven of us to go. He even offered to pay for us but after that mental image of them cleaning passed through my mind I took the higher road and ended up paying for them as a thank you. Jamestown Settlement is really cool; it’s what they call a “Living Museum.” They literally have soldiers in the streets and people going about their business like it is still the sixteen hundreds. In fact they even had replicas of the three original ships that brought the first European colonists to the states for you to explore. 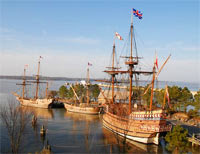 It’s practically an entire city replicated after Jamestown, where you feel like you have traveled back in time. If I told you everything there was to know I would be teaching you a history novel on the entire sixteenth century. But this place has so much entertainment and live demonstrations of how people of that era went about their daily work. It is definitely something I would like to do again, and my kids loved it!